Catch the last few days of the Frank Bowling exhibition at ROLLO Contemporary Art. One of the most significant abstract painters still alive is showing his paintings until 3rd September. Go see great painting like this..
An artist of international standing, graduated from the Royal College of Art in the Sixties, hugely successful in the United States, where he still has a studio. Bowling has works in many European museums, the Metropolitan Museum, New York and the Tate in London, yet still not hugely known as, say Hodgkin (see earlier post), why is this? Why have the Tate not had a retrospective of Bowling's work?.. 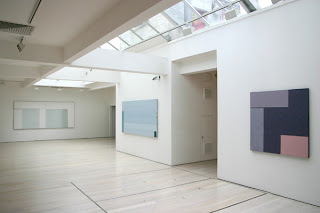 Alan Green, one of England's most significant abstract painters who died in 2003, is having an exhibition at Wiesbaden Museum in Germany 'Paintings, Drawings & Prints' 6 June - 26 September 2010.
' "For Alan Green abstract painting is the ultimate reality” Diane Waldman, Guggenheim Museum New York, 1980. Alan Green (1932 – 2003) wanted to create “ordinary paintings as ordinary as the real world”. This came from his belief that, in the second half of the 20th century, artists carried too much baggage to be able to experience “things”. Green was one of the great British abstract artists whose formative years were spent in London in the 1960s. He was trained as an illustrator and graphic designer which freed him from the theoretical constraints of art history. In the mid 1960s he made field paintings (which were remarkably advanced for their time) – in which his colour and its application dictated the form. 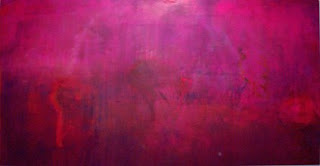 His paintings are deliberately non emotional and controlled.